In his latest review, Ceasefire's classical and opera critic, Paul Guest, gives his verdict on the UK premiere of The Passenger at the English National Opera. Michelle Breedt, Giselle Allen, Kim Begley, Leigh Melrose. Emotionally exhausting and challenging, powerful drama and fantastic score come together to produce an opera of intense unreality which is, as we know, a horrific reality. Making her ENO debut, Michelle Breedt sings Annaliese Franz, a German “proud to do her duty” as an SS Overseer in Auschwitz – a woman, needless to say, haunted by her own life due to a sighting of a recognisable but mysterious passenger on board an ocean liner to Brazil. What we see is her explanation to her husband of events in Auschwitz, and her treatment of one particular prisoner, Marta. Breedt, as well as displaying beautiful yet characteristic vocality, portrays an enormous, dramatically-intense role to absolute perfection. As do the female prisoners, presented with hugely intense roles, all with dreams of freedom yet clinging to their unchanging and hopeless existences. Julia Sporsen, who plays the Russian prisoner Katya, sang an enchanting and, ironically, captivating unaccompanied Russian folk song, during which she held the silent attention of the Coliseum in a moment of unparalleled beauty. Above remained Franz’s Husband, representing us, the unknowing majority, being fed on second-hand stories, as we all gaze from afar. The Orchestra had a strange role in this opera; the orchestral part presented more of a visual meaning than, indeed, an effective accompaniment. With the exquisite vocal scoring, however, the orchestra managed to play both roles, with its heavy percussion, ever soaring flutes and chilling string parts. Leitmotif surrounded the clarinet part, appearing through the orchestral abyss to present moments of hope. The orchestra spent its time retaining this unimaginably intense reality that we can and will never fully comprehend – conducted by Sir Richard Armstrong, who brought out the score’s finest moments of poignancy. 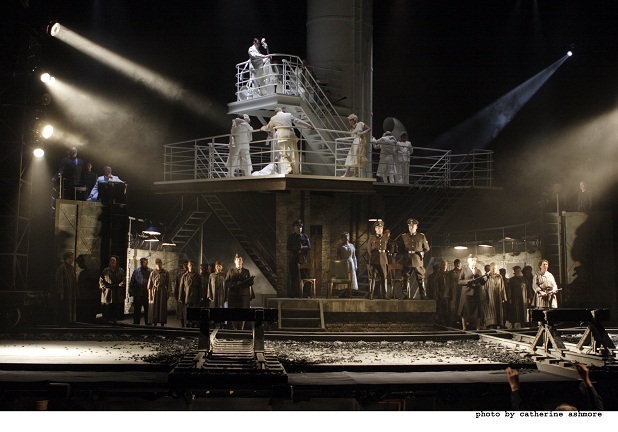 The set design, by Johan Engels, was heaving with connotations- above, the white ocean liner, pristine and clean, represented a new world and, ultimately, heaven, while below was the desolate and despairing world of Auschwitz – of Hell. The production is very still and lingers in places that you don’t want it to linger, the pace can become slow, but I would say that it wasn’t the music that was central to this production, it was the narrative which was portrayed in every way to its full extent under the masterly direction of David Poutney, whose staging penetrated our minds and souls with this moving story, based on the real-life experiences of Holocaust survivor Zofia Posmysz, who herself was imprisoned in Auschwitz. Her story is too unimaginable to fathom, and her arrival onto the stage during the curtain call last night deservedly produced a standing ovation of respect and admiration from an audience moved by her profoundly harrowing experiences. Paul Guest is Ceasefire‘s Classical Music and Opera critic. He also contributes to MUSO magazine, WIRED, Classical Music Magazine, and is the resident interviewer at Opera Britannia.